15% Off Weeknight Rates. On Lookout Mountain. Includes In-Law Suite. Sleeps 6. Plenty of outdoor space to enjoy. Tranquil Mountain Home The deck is great for outdoor meals. Living area. Very comfy. The backyard. The deck, fire pit, and separate building with bedroom and bathroom Want to play a game of catch A second comfy living area. The bedroom/bathroom above the garage. Who`s ready for dinner Bed and bath. The master bedroom. The dishwasher makes for an easy clean up. The second living area. Washer and dryer. Plush towels provided. All you need. A twin and full bed make up the bunk beds. A great spot to wake up Come on in Apartment above the garage Apartment above the garage There is a private, wooded spot behind the house with chairs and a fire pit. 6 miles to Rock City. Private and secluded updated home. Separate "in-law suite" with king bedroom and bathroom. Fire pit in the back yard and a second fire pit in the woods. Want to get a little taste of the farm life without having to break out your muck boots? This farmhouse chic 3 bedroom, 2 bath cottage is nestled among farms on Lookout Mountain. Experience the true southern culture relaxing on the front porch rocking chairs, drinking sweet tea, and watching the cows graze across the winding country road. With an expansive backyard, fire pit, charcoal grill, outdoor dining area, and the perfect climbing tree, it is an idyllic place to reconnect with nature while enjoying the comforts of home. Be rest assured, you don’t have to compromise luxury at this cottage. With comfortable beds, energy efficient appliances, and beautiful furnishings, you can experience the rustic chic lifestyle! The master bedroom suite features a king sized memory foam mattress, dressers, clean plush carpets, and a television. You don’t have to worry about bringing too many clothes with the large walk through closet. Connected to the closet is the master bathroom, which features shelves for storage and a combination tub and shower. The second bedroom features a modern set of bunk beds with a twin on top and full sized mattress on the bottom. With the clean plush carpets, attached bathroom, and a good sized closet, this room is a great choice for kids or two adults who don’t want to share a bed. Also, there is no ladder to climb to get to the top bunk, there is a set stairs that are a little easier to climb! For the third bedroom, you have two options! With an "in-law suite" over the garage and pull out sofa in the spare room, this house uniquely offers flexibility depending on how your group would be most comfortable. If you’d rather all be under one roof, you may open up the sofa in the spare room to allow extra sleeping space for two more people. If you would rather have more privacy, the apartment above the garage is furnished with a king sized bed, tv, and bathroom with a shower. (Due to limitations of septic systems, this house and garage apartment can only accommodate a total of 6 people). The house has a cozy living room with a sofa, rocking chair, television, and an electric fire place. This house is set up with cable and high speed Internet. The updated eat-in kitchen features stainless steel appliances, including a fridge, stove/ oven, microwave, and coffeemaker. The kitchen also includes a dishwasher to make your vacation less about washing dishes and more about having fun. If you chose to utilize the garage apartment, the spare room would make the perfect place for additional dining space, a temporary office, or play area. Located less than 2 miles from Lula Lake Land Trust, this house is a convenient location to Lookout Mountain attractions. The drive is approximately 12 minutes to Rock City, 19 minutes to Ruby Falls, and 25 minutes to downtown Chattanooga. Beautiful shade trees over the side deck and the quiet neighborhood cultivate a tranquil retreat. Let your kids run through the backyard, see some cows up close, and get away from the hustle and bustle to taste a piece of the easy life. This house is the perfect combination of country life with city comforts, and it is sure to nurture good memories. We would love to help you make some new memories! In addition to Air bnb's terms and agreement you also will be expected to sign a rental policy and agreement that covers our companies terms and conditions of rental. This agreement protects you as our guests, our property owners and our company. Bathrooms 2 Bathrooms In The Main House (1 Is A Master), 1 Bathroom In "In-Law Suite"
The property was adorable and very clean. The morning sunrise view is amazing and the birds singing make you want to sit on the front porch for hours! Like its name, the property is very tranquil and a close drive to all the attractions. "We absolutely loved our stay at Tranquil! The home was sparkling clean, beautifully decorated and so, so cozy. It was hard to motivate ourselves to leave it. My youngest also loved the backyard with the gorgeous hardwoods, fire pit, and space to explore. 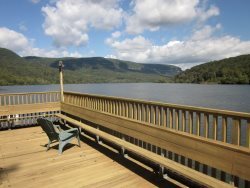 The home feels very private, even though it is a great location, just minutes away from Rock City and close to Cloudland Canyon and Chattanooga as well. We'll definately be back!"